A gentle and relaxing series of stretches to support muscular and joint flexibility, cultivate balance and well being, coupled with a meditation practice, at the end, to clear, calm and focus the mind, improve mood, and provide systematic relaxation. Practice asana, pranayama and relaxation to strengthen, stretch and energize your body; calm and clear your mind; encourage self-inquiry, self-acceptance, inner wisdom and peace. A gentle and relaxing series of stretches to support muscular and joint flexibility, cultivate balance, mental focus and a sense of well being. Do you wish to learn or continue to learn the art and science of meditation? Join us in 2019 for our monthly series to discover and investigate with other curious minds. Nadia Puttini, owner of BareSole Yoga, holds a MA in Expressive Therapy from Lesley University, is an experienced E-RYT 500 registered Kripalu Yoga Teacher, and a C-IAYT certified yoga therapist with more than 4000 hours teaching and client hours. She fell in love with TM meditation at 12 and practiced intensively for a decade, gradually integrating the study of the body through improvisational movement and yoga while continuing her exploration of meditation. 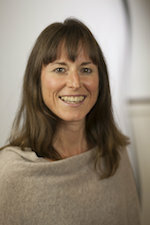 Some of her favorite meditation teachers are Jonathan Foust, Richard Faulds, Sally Kempton, Richard Miller, and others. Nurturing the integration of body and mind is one of her greatest passions. Multi-instrumentalist Mac Ritchey brings a diverse palette of sounds and skills to both performance stage and recording studio. His music has been sculpted and influenced by an assortment of genres and cultures, from classical Turkish to rock, jazz to reggae, the traditional to the cutting-edge. 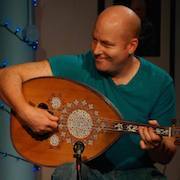 For the past 10 years, Mac’s primary instrumental focus has been on the oud, or ‘Arabic lute’. His other instruments include guitar, bouzouki, çümbüs, saz, and didjeridu, as well as many forms of drums and percussion. Ritchey is a prolific composer and a member of the music groups 35th Parallel, Esthema, Dunham Shoe Factory, and The Response. He has toured the US over the past two decades, performing and educating. Mac’s involvement in music goes behind the scenes as well as an acclaimed music producer and proprietor of Possum Hall Studios in Carlisle MA. Credits include MTV “The Real World” (Sarah Fimm), Native American Music Award 2008 “Best Instrumental Album of the Year” and Grammy Entry List (Evren Ozan), and even the daytime drama “All My Children” (Eric Colville). Mac currently lives in Carlisle MA and works tirelessly at keeping the deer from eating his vegetable garden. This class fills! *Register Early* to ensure your spot.